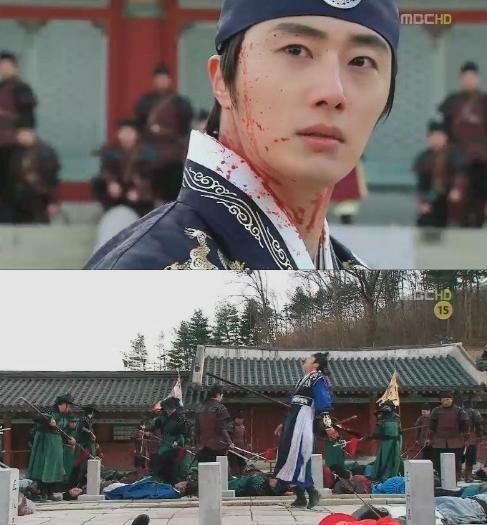 The tragic death of Prince Yang Myung (played by Jung Il Woo) in The Moon that Embraces the Sun touch the tear gland of audience. In the grand final of MBC drama The Moon that Embraces the Sun aired on March 15th, 2012, Prince Yang Myung betrayed the Yoon Dae Hyung whom revolted together with him, and ultimately was killed by the rebel force while protecting the king Lee Hwon (played by Kim Soo Hyun). Prince Yang Myung kept the list of persons involved in the rebellion on his chest, and turned to supress the revolt. When all rebels are killed, and victory in sight, suddenly a man holding a spear rushed toward Prince Yang Myung. Lee Hwon who saw the scene shouted, “Brother be careful.” But Yang Myung put down his sword, and said to Lee Hwon, “There can be only one sun in the sky, in future there won’t be rebellion because of me,” and eventually was stabbed by the spear threw by the rebel, fell to the ground instantly. Before his death, he said, “I used to hate Your Majesty who has everything, and occasionally has ambition on the position of Your Majesty, but for me, a friend and younger brother is more important than position of king,” and permanently closed his eyes.